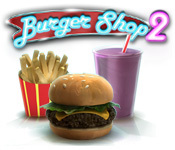 Burger Shop 2 is rated 4.8 out of 5 by 116. Rated 5 out of 5 by Eveoflove from Can the sequel be better than the original? Review based on completed game in "Story" Mode. This "serving customers" type of TM game is just fantastic. A few things have changed from the original "BURGER SHOP"; do yourself a favor and start with the original before tackling "BURGER SHOP 2": you'll develop much needed techniques you can apply to this one. Just like the original, there are 3 modes of play: 1) "STORY": you start with very little equipment, a small menu and patient customers; it's a good way to learn the mechanics. 8 restaurants, 15 levels each (instead of 10), and they get progressively more difficult as the menu becomes larger, the dishes more complicated (like a triple bacon cheeseburger with lettuce and ranch dressing) and the customer base more diverse (I especially liked the ideas of the "dog lover" and the "shirtless guy".) 2) "CHALLENGE": unlocked once STORY mode is completed, you can play the 120 levels in a tougher setting. 3) "RELAX": don't let the name fool you... it just means that customers don't leave until being served; you can choose any restaurant as well as time of day (breakfast/lunch/dinner/all day); in this sequel, the stats accumulate regardless of combinations. A GREAT way to practice strategy. Here are the other changes compared to the original BURGER SHOP: - you play each restaurant for 5 "days", each day having a breakfast, a lunch and a dinner (the menu, dishes and equipment changes depending on the meal.) - an enhanced BurgerBot: you choose every time whether to fill a customer's entire order, or fill 1 "dish" from every customer. This will become critical later in the game to maintain everyone's level of happiness. 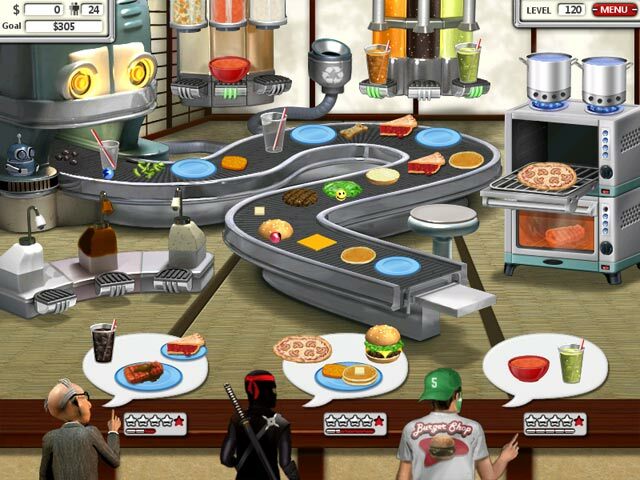 - a much larger menu, some dishes requiring more steps than in the 1st game. - some ingredients can now be used in more than 1 way (e.g. English muffin toasted or not, potato baked or boiled) In the first game, you had to deal with different sizes for sodas and fries; this is true again, making predictions/preparations more difficult. - There are more customer types. No reason to panic, but you'll need a somewhat sharp memory to remember some new recipes (e.g. toasted waffles with powdered sugar, chocolate syrup and whipped cream). There's more equipment, and it's not the same throughout the day (e.g. cereal dispenser vs. soup dispenser.) Like pretty much everyone, I strive to get 5 stars on each level, but I just couldn't do it (yet! ): I ended up with an average score of 4.62 stars. You can replay any level to improve your score. Lastly, to those familiar with the original, the strategy in the last 1 or 2 restaurants is slightly different: not only do you need to choose which dish you'll serve to which customer, you'll also need to decide which dish to prepare: because the menu is more complicated, I realized that sometimes I ran out of space on the conveyor to complete my dish... so I used that shelf at the end of the belt a LOT more often than in the first game. Fun and challenging, without being frustrating... assuming you click promptly and remember how to "assemble" what you need. The story unfolds at the completion of level 120; try to stick around after that for the credits with some amusing "traits" of your customer base. Rated 5 out of 5 by chersbldhnd from My Go-To game Watch out: this game is addicting! I start out playing other games, but always end up playing this one! Great levels with varying difficulty. You'll never be bored with this one. Rated 5 out of 5 by kayla1298 from burger shop love burger shop. hot dog I love playing games. Rated 5 out of 5 by J9CT from BS 1&2 - BEST TM GAME EVER!!!! Burger Shop 2 was my first time management game ever and I'd say you don't get better than this. I keep trying to find others that compare but there is nothing close except for Burger Shop 1. This game is challenging and BS 1 is even more so. To this this day I can't get gold stars on all my challenges on story mode and neither can I on challenge mode. I bought this game in 2016 and I realized that I haven't even started expert mode, there are just so many challenges. Buy this game and BS 1, you won't be sorry. 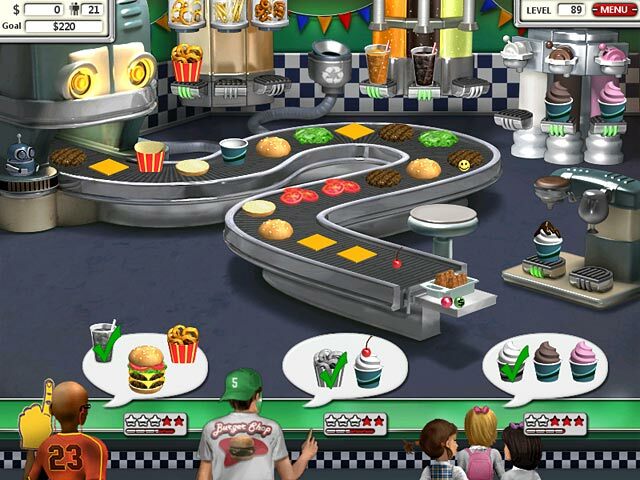 Rated 5 out of 5 by OhmOmair from All-Time Favourite I love both Burger Shop and Burger Shop 2; BS2 slightly improved version with more features. I've owned this game for some time and still play it daily; and enjoy the expert mode and challenge mode as well as the music (which you can choose the songs from a drop down menu) and humour within the food recipes. 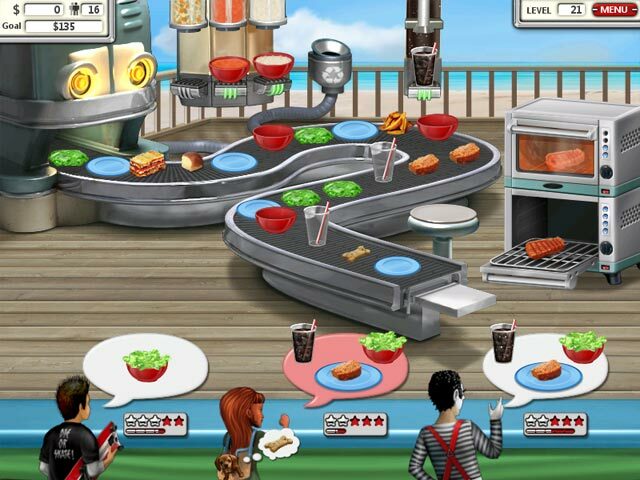 I wish the creators would make Burger Shop 3 because it is a lot of fun and have not found another game comparable to it. Rated 5 out of 5 by sayuri_18 from after years still one of my favorite games It's been years since this game was released, but i still love occasionally re-playing it. it just doesn't get old! i'm still hoping they will make another sequel. Rated 5 out of 5 by sndock from Burger Shop 2 is the best I have been playing Burger Shop 2 for years. It never gets old. This game is for fans of the Time Management game genre as well as those who ordinarily find it stressful. Serving food has never been more fun!